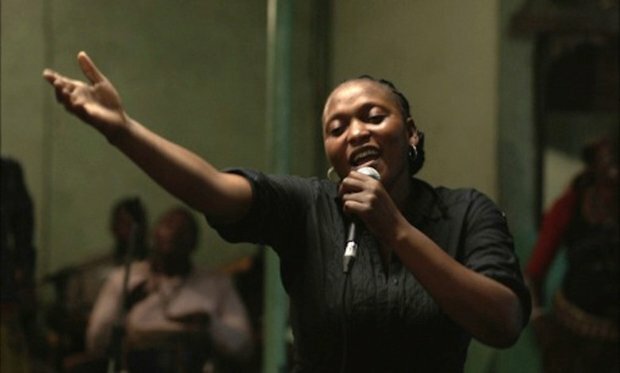 In the Democratic Republic of the Congo, bar singer Félicité (Véro Tshanda Beya Mputu) is carving out a meagre, yet defiantly independent existence. We first meet her, in the tiny shack she calls home, as she bemoans having to fork out for yet another refrigerator repair. When her son has a serious motorbike accident and needs life-saving treatment, however, Félicité must find the money by any means necessary. This fourth feature from Franco-Senegalese director Alain Gomis – the winner of the Grand Jury Prize at Berlinale 2017 and Senegal's official entry to the 2018 Oscars – is meandering and, at times, heavy-handed. It weaves a fairly thin (and, despite its surroundings, narratively conventional) story with frustratingly impressionistic moments, including dreamlike sequences in which Félicité wanders in a forest and unexplained scenes of an unconnected classical choir. Yet anchored by an astonishing central performance from newcomer Mputu, Félicité overcomes its less successful elements to become an intense, intriguing character study of a fascinating woman. When the focus is on her – and, indeed, all other characters, including womanising love interest Tabu (Papi Mpaka), are so thinly drawn as to dissipate in her shadow – the film comes alive. As she traverses the dusty city of Kinshasa, Félicité's dignity is underscored, rather than undermined, by the cacophonous backdrop of modern Congo. As musicians play on every corner and animals roam the streets, cinematographer Céline Bozon films, in often disorienting close-up, an unrelenting mayhem through which Félicité moves, stoic and resolute, with a grim determination that she struggles to keep from tipping into desperation. As she begins to regain control of her life and embarks on a tentative relationship with Tabu, Félicité gradually comes out of her emotional shell – well, as much as she is able. And that seems to be the film's overarching, universal message; if you allow yourself to connect with others you can, like that anomalous choir, create harmony out of discord. Selected release from Fri 10 Nov.
Bar singer Félicité (Mputu) carves out a meagre but independent existence in Kinshasa when her son has a serious motorbike accident. A thin and rather conventional story is anchored by an astonishing central performance from newcomer Mputu, becoming an intense character study of a fascinating woman.